The Simplex Word is a blog dedicated to providing thought provoking articles and insights on trends in areas ranging from leadership, Human Resources, business, work life balance, and careers. Like many people you worked relentlessly to build a successful career. Over time you’ve likely received promotions, salary increases, and greater job responsibilities. You were regarded as a high potential employee, assigned choice projects, and did whatever was necessary to get the job done. You abandoned the traditional 8am-5pm schedule, arriving to work early and answering emails or phone calls in the evenings. You spent time preparing for meetings by studying pre-reads, researching attendees, and developing your strategy on making the most of those chance encounters with the higher ups. Coming in to work each day with a packed schedule was exhilarating and you even broke the silence of the elevator ride (gasp) by chatting with others as you rode up to your destination. Then things gradually begin to change. You start leaving for work a little later each morning and replace your strategy encounters with higher ups with a plan on how to get through the day “under the radar”. Your elevator conversations are traded for heavy sighs as the elevator stops on every…single…floor. Your frustration peaks when your schedule is filled with back to back meetings until one day you reach over the folder of unreviewed pre-reads to grab your phone, unable to resist the enticement of escaping your reality for another mind-numbing attempt at level 364 on Candy Crush. When I found myself trapped in an unfulfilling career I felt myself going down a path of a gradual, agonizing, demise that slowly depleted my energy and joy. I attempted to fight the boredom with the little electronic device tethered to my hand. The memes, Instagram posts, and games I could never admit to anyone I was playing, allowed me to momentarily flee from the indifference I felt. No one noticed my waning productivity because of the reputation I worked so hard to build over the years. So, I continued to get by, ignoring the warning signals that I needed to make a change. I won’t lie, change is frightening and it’s tough. Change takes courage and something as bold as a career change will test your tenacity. Making a change when you are firing on all cylinders and at the top of your game is hard enough, but when you’ve been spinning on that hamster wheel of boredom for a few years too long it can seem unfeasible. Once people realize they have real value they can offer in the larger world, they become overwhelmed, not knowing where to start. Most individuals know they want emotionally and intellectually stimulating experiences but the thought of finding a job that gives them meaning and purpose seems unrealistic. The good news is that people discover meaning and purpose in their careers time and time again. Many find the process insightful, and those who invest in the guidance a good coach can provide, find it worthwhile. Regardless of whether you hire a coach, you too can develop a strategy to exit the wheel of boredom. I’m sharing with you 3 key questions I used myself and with my clients when they are struggling to find meaning and purpose in their jobs and careers. 1.What would you do if money were no object? This is a simple yet powerful question because play is a primary activity for developing and discovering our strengths. We tend to have fun doing things we are good at; thus, we are likely using our strengths. You will not find your calling in your weaknesses. Write down ten things you get enjoyment from. If you can’t jot down the first 5 or 6 things easily, then reflect back to your 8-year-old self and write down what you did for fun back then. This will give you a glimpse of times when your strengths were being used. 2. Who do I enjoy helping? This is an essential question when attempting to tap into your purpose. We all do things that help others every day. Many clients struggle with this question because they immediately go to charitable acts. They get stuck and feel they don’t help others if they are not the President of the PTO or on the board of a non-profit organization. Many people forget the many other roles they serve: parent, child, sibling, friend, or spouse. They overlook the fact that others could enjoy listening to the music they create, eating the food they cook, or snuggling with the blanket they crafted with care. So, go ahead and add the “Who” to your list of “What’s”. 3. How would you want to be remembered? I know this can be a bit morose but stick with me for a moment. Linda Ellis wrote a poem called The Dash. The premise of this poem is based on the concept your life is made up of two dates and a dash: the date you were born and the date you die. What would you want people to say or remember about your dash? The answers you write down for this question are typically the things most important to you or things that define you such as values, thoughts, or actions. Reflect and write down the legacy you want to leave behind. Once you have contemplated your answers to these questions you can begin to see how you can combine the “What”, “Who”, and “How” together to find and/or create meaningful work. Whether you are trying to find meaning in an existing job or exploring a new career, these questions are the baseline for your next steps. I have used these questions with clients to create mind maps that lead to new ventures or the groundwork behind creating a personal mission and values statement that can be used as a basis for making major life decisions. 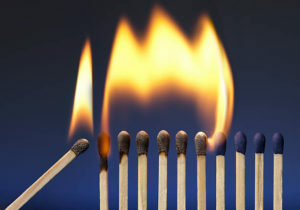 Contact Simplex HR today to ignite your passions and revitalize your career. Shannon Stickney is a life and executive coach and the founder of Simplex HR, a coaching and human resources consulting firm committed to guiding and inspiring people to grow and achieve exceptional outcomes in their personal and professional lives.